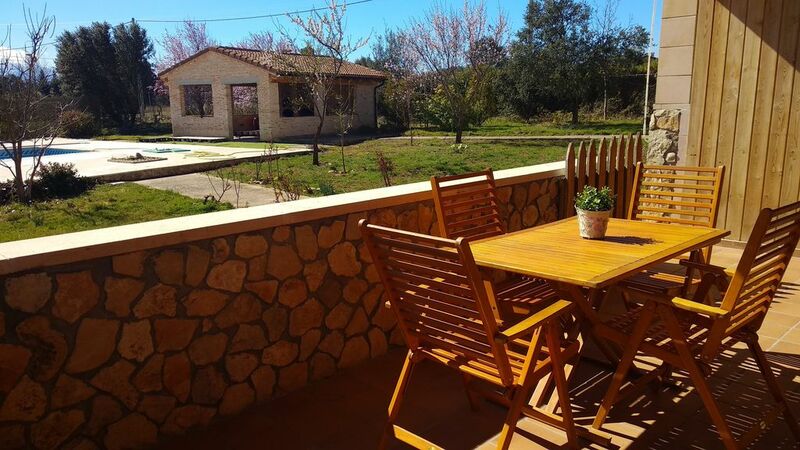 Country house, located in the Prado Pinilla Urbanization within the town of Fresno de Cantespino, Segovia, 6 km from Riaza and 100 km from Madrid by the A1 road. The ground floor has a kitchen with dining area, a living room with fireplace, three double bedrooms and two full bathrooms, while on the top floor there is a double room and a room for leisure with games (Wii, Diana, games of table, books). The total capacity of the house is 8 beds distributed in 4 double rooms and two bathrooms. Three of the rooms have double beds and the fourth room has two 90 beds that can be used together or separately. We also have a travel cot with prior notice. The house is located in a totally enclosed farm with garden where there is a private pool for the summer season and barbecue area. The house is ideal for families who like to enjoy nature in a quiet environment and to visit the surrounding sites such as Riaza, Ayllón, Las Hoces del Río Duratón or La Pinilla ski resort. There are also countless routes for bike or walking excursions.